Hi everyone, yes as you can see, I have another banana peanut butter recipe for you and these muffins are so good! I had a friend give me 3 big cases of yogurt last week and I told her I’d make a batch of somewhat healthy muffins to repay the favor. You’ll be so happy eating one of these bad boys for breakfast, they are soft and full of fabulous flavor! I baked one muffin in a small ramekin then wrapped it up for my friend. Give it a try, it makes a cute homemade gift! No worries if you are not a coconut fan, just leave it out. I made half with coconut topping for me and half without to satisfy my picky coconut hating husband! Hope you all enjoy! Up next are my newest stuffed shells that will have you stuffed in NO time! Come back soon! They look awesome and your photos are great! I love the idea of baking them in the ramakins! They lok terrific! What a great idea, they look like little souffles! What a treat for breakfast-and I love the idea of baking one in a ramekin…that’s the perfect gift for a friend, for sure! oh Jenny – This look fantastic!! Great job with this recipe. These look so terrific! Your photos are beautiful as well. I love the muffin wrapped up and tied with the lovely ribbon. These look terrific. Saving them to my Delicious account right now! What a great idea to bake it in a ramekin! I love it! The recipe looks great, very low fat and high protein, perfect for the kids! I’ll make these next, since anything with PB and banana has proves very successful in this household! Great photos, and thanks for sharing this recipe! I love banana muffins and then on top of that chocolate chips? Great combination. Hope you don’t mind but I’d love to direct Foodista readers to your blog. Just add your choice of widget and you’re all set! I bet my kids (and my husband and I for that matter) would love these – they look wonderful! Awesome looking muffins! I love bananas muffins, or banana anything for that matter. Wish I had a couple of these right now! What a great recipe. I love PB and CCC. These look fabulous. What is with the Flake family coconut hating? Derek is the same way. How was your first earthquake! Oh I have to try these Jenny! I love PB/Banana everything. I’m obsessed with it actually. My whole family would love these! They look great! Oooh I love these and I love the packaging! I’m a sucker for individual desserts. Especially anything banana! These look and sound absolutely amazing. Can’t wait to try! Oh my goodness! These muffins look heavenly. I love the coconut sprinkled over the top, too. And the presentation in the ramekins is brilliant! Sorry that I’ve been an absent commenter; I just finished up my law school exams and am finally getting around to my google reader. These muffins looks great, I can’t wait to try them. I am always glad to find healthier recipes. I have to agree with your husband here, I’m going to make mine without coconut, but to each his own! Yum, these look terrific. I’m happy to have stumbled on your site today; got here because I looked up “roasted banana bread” on google. I just made some yummy roasted banana muffins, and was curious about other roasted banana recipes as I’ve never done that before. I’m going to go poke around your site. I have a feeling there’s a lot to love here! Thanks. What a great muffin! I’ll have to try them out, my oldest son and I love a good muffin in the morning. I have been on a total coconut kick lately, so these are calling my name! These look like they are anything but healthy 🙂 Thanks for this post – You might like to check out our May Monthly Mouthful where food bloggers shared their healthy cooking tips. yey for muffins! and double yey for peanut butter and banana! Hi Jenny how are you? 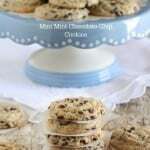 I just made these and realized half way through that I was out of chocolate chips! I was so mad so I used peanut butter chips and they were still fabulous. Next time I might use half chocolate and half pb chips. The extra pb flavor was awesome. All your creations are so amazing. Thanks for another great recipe! I’m sold! These looks amazingly delicious! I made these!!!!! they came out great!!!! I made these today. They are so delicious! I could only make a few with the coconut because I’m the only one eats it. They don’t taste “healthy”; the kids will never know. Thanks for all your delicious-looking recipes. I came across your website yesterday and am in love! I went from being in a food rut to suddenly feeling excited with all your great ideas and the pictures really top it off. My toddler and I are always making muffins and I want to try this recipe. I just have a quick question, I’m always going through bananas so fast we don’t always have them on hand when I want them for something like this, are there any good substitutes for bananas in baking? Does applesauce work? These look great, I can’t wait to make them!! Question, could I replace the yogurt for milk? I just realized I’m out of yogurt!